Find a Hiking & Trekking trip that explores Nordic / Scandinavia. There are 57 tours to choose from, that range in length from 3 days up to 19 days. 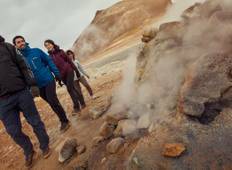 You will visit outstanding places like Reykjavik and Landmannalaugar! "A great experience with a variety of beautiful and breathtaking hiking and touring..."
"The trek was great. Our guide, Martin, was off-the-charts excellent. The best guide..."
"This tour was so much fun. I can’t say enough about the beauty of Norway. Each..."